Find My Workspace lists over 95% of the business centres market in Staveley (Cumbria). Simply click Request Quote to check pricing for one office, or Add to Basket for multiple offices. 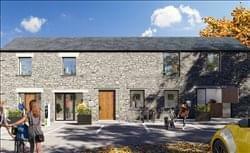 Located in the heart of beautiful the lake district, this space has been transformed into creative workspace suitable for office or leisure use from one to thirty person businesses. They all have their own front door and give companies the opportunity to create their own identity. All offices have their own kitchens, toilets and some have added quirks including fire places. Meeting rooms are also available.